Do you give your kids gifts for Valentine’s Day? I know for some families, it is a gift-giving occasion; others not so much. As I’m writing this, somewhere between Christmas and the month of love, I’m surprised to find myself leaning toward the no-gifts-necessary camp. Since I adore giving (and, obviously, getting) presents, especially to my kids, I’m blaming my feelings on the fact that in my house, our family of four has three birthdays in the few weeks surrounding Christmas. I’m saying it’s a lot of gifting. If you aren’t familiar with love languages, it’s a tool created by Gary Chapman and explained in his book, The Five Love Languages. Since Valentine’s Day is a holiday all about love, it does make sense to make plans with love languages in mind. And, whether you are a virtual Cupid who adores everything red and pink or a cynic who rolls her eyes at “that holiday the card companies made up,” considering love languages when making your Valentine’s Day plans is smart. Because either way, you want your efforts to be worth it! Right? You want your people to feel loved and for your time and resources to be well spent communicating how much you value them. If you know your kids’ love language, I’ve got some great, last-minute ideas for you. This category might seem like the easiest one, but you shouldn’t just grab the fluffiest teddy bear at the gas station on your way home! Instead, try to remember something they’ve mentioned wanting since Christmas — perhaps something that made you roll your eyes because you don’t need that and we just had Christmas and wait until your birthday! While I definitely use Christmas and Easter as holidays to give some practical gifts, I think it’s fun to give unnecessary, frivolous, fun stuff for Valentine’s Day. One of my daughters has picked up the habit lately of saying, “My friend has [________]. I love it and I want it!” I’ve tried reminding her that she can admire something without immediately coveting it. But she’s five, so it’s a hard lesson to learn. Still, if your kids mention things like that, it might be fun to surprise them with their own for Valentine’s Day. If you have a child who insists on saying, “No, I love you more!” you might have a words kid. Now, I have no scientific data to back this up, but I suspect many words people are like me and, as much as they crave the affirmation, they certainly do not want them said to their face! Instead, write your kids a love letter! If they’re younger — still in the coloring pictures stage of life — draw or color a picture to go with your words. If they’re older, send an email or text. Or make a video of yourself telling them how much and all the reasons why you love them so much. Whatever medium you use, make it something they can absorb slowly, alone if possible, and keep to re-read or re-watch over and over again. My kids love when I help them clean their rooms. But I think they’re a little unusual in that (I remember not wanting my parents to clean my room for fear my favorite books, toys, or — let’s be honest — junk would disappear!). However, since we’ve been working on sharing household work as a family (aka, I’ve been making them do chores), I know their rooms aren’t the only things I could clean as a way to show my love. I’m pretty sure checking any of their chores off the list around Valentine’s Day would earn me major mom points. So, depending on which chores your kids detest most or which tasks stress them out, taking something off their plate for the day or the week might be a huge gift to them. You could also fix their favorite meal, drive them to school if they normally walk, or finally get around to replacing batteries in their toys or hanging frames in their rooms (or whatever to-do has been stuck on your list for months)! Just give them a hug and kiss, and call it good, right? Most of these ideas involve spending more and different kinds of time with your children. But perhaps you want to really go all out and plan a date with your kiddo who needs quality time to feel loved. You could send an official invitation (via letter in his lunchbox or a Post-It on her mirror) to get started. Then dress up, pick them up at the door, and eat at their favorite restaurant. If you wanted to do more, you could use your time together to make a bucket list of activities to do together. Or you could take a list of “get to know you” questions and ask (and answer!) a few of those together. Or play a board game, look through old photos, or challenge them to a round of that video game they’re always talking about. Whatever it is you do this Valentine’s Day, have fun! No matter what language you speak or what plans you make, they’ll feel cherished and appreciated by the effort you take and the memories you make together. Looking for more great parenting ideas? Here are a few of our favorite articles! How do you plan to celebrate Valentine’s Day with your kids? Mary Carver is a writer, speaker, and recovering perfectionist. She lives for good books, spicy queso, and television marathons, but she lives because of God’s grace. Mary writes with humor and honesty about giving up on perfect and finding truth in unexpected places on her blog, MaryCarver.com. 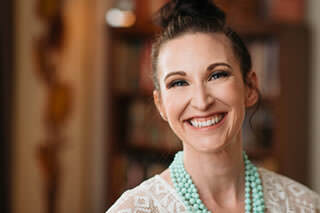 She is the author of Fast Talk & Faith: A 22-Day Devotional Inspired by Gilmore Girls and co-author of Choose Joy: Finding Hope & Purpose When Life Hurts.She is also a regular contributor to incourage.me and MothersofDaughters.com. Mary and her husband live in Kansas City with their two daughters.